The Marvel Cinematic Universe returns to outer space with James Gunn’s Guardians of the Galaxy Vol.2; the story of Peter Quill learning about his origins. I’ll start this by saying that I had issues with the first Guardians of the Galaxy. Most of them stemmed from my personal inability to connect with the tone. Everything else was strong but I struggled with it because the sense of humour wasn’t to my tastes. The reason I bring this up is because it’s important to highlight that I was less than enthusiastic about seeing a sequel. I’ll see everything in the Marvel Cinematic Universe but there are some I’ll be looking more forward to than others and this is one that I wasn’t really looking forward to. My short impression is that I liked this a lot more than the first movie. I found the humour easier to connect to and effort was made to deepen the character dynamics that worked so well in the first film. I’ve heard people say that it’s more of the same and suffers as a result but I found it to be better executed than its predecessor. The plot this time around is that Peter Quill aka Star-Lord (Chris Pratt) is found by his father, Ego (Kurt Russell) and learns a lot more about his place in the universe. Connected to this is Gamora (Zoe Saldana) dealing with her sister, Nebula (Karen Gillan) and the rest of the team having their own smaller arcs that weave throughout this. One thing this film accomplishes that many Marvel Cinematic Universe films fail to is that it has a solid villain. Kurt Russell’s Ego is developed as a character and builds up to being an antagonist. The writing may not be as sharp on this character as it could be but Kurt Russell throws himself so completely into the role and delivers a first rate performance that elevates the material. It helps that he has great chemistry with Chris Pratt which allows for some really fun interactions that definitely form the heart of the film. The father/son relationship is something the film spends a lot of time on and it does a lot to ground the fantastical science fiction elements into something relatable. At its core this is a film about a son meeting the father he never knew and learning more about him. Gamora’s scenes with Nebula aren’t quite as strong but there is an emphasis on them being sisters and there being something broken about that relationship. This is also something that’s easy to relate to and keeps things on a level that makes more outlandish concepts easier to accept. More work was definitely required to make this relationship more believable but it wasn’t bad as it appeared. In general the main theme of this film is family. Outside of the relationship between biological family members there’s an attempt to explore what makes a family in the larger sense. Yondu (Michael Rooker) essentially raising Peter is a significant factor that pays off in a big way and there’s repeated mention of the Guardians themselves being a family unit. The rest of the team largely fade into the background. Rocket (Bradley Cooper) is entertaining enough and has a small arc where he has to learn to not push his friends away. It’s not hugely well handled but there’s enough there to justify his presence. Drax (Dave Bautista) is a delight throughout. He has the least development but that’s almost the point as he is always true to himself. It does mean that he feels somewhat static as a character but Dave Bautista is clearly having so much fun that it’s almost forgiveable. Many of the most humorous moments for me came from him and he is certainly capable in the action sequences. 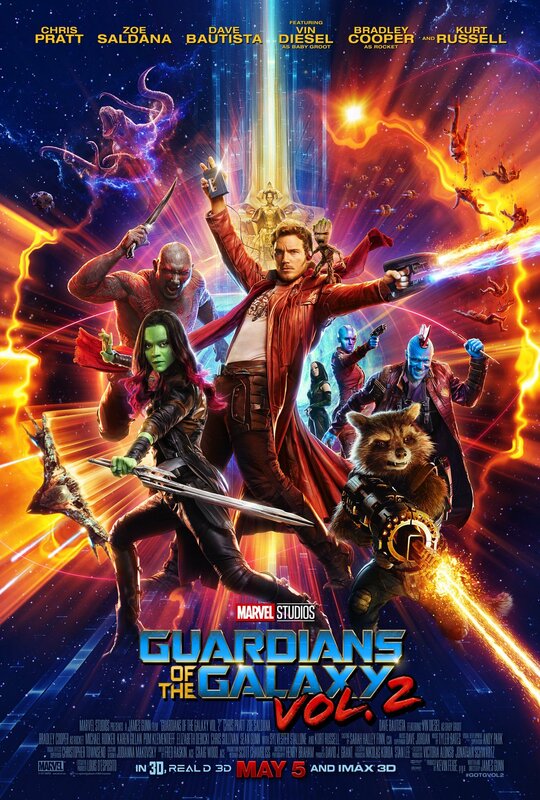 Vin Diesel returns as Groot -though this time he is known as Baby Groot for obvious reasons- and there’s absolutely nothing to say about his vocal performance. He says exactly three words every time and they are so heavily distorted that it could be anyone saying them. Despite that, Baby Groot is another highlight that the film has. The running gag about his inability to understand simple instructions is funny and he is used to great effect throughout. There are some new characters introduced such as Mantis (Pom Klementieff) who strikes up an unlikely friendship with Drax and is a very serviceable background character who doesn’t have much effect on the plot despite her screen time. Sylvester Stallone’s small role as Stakar Ogord aka Starhawk makes for a welcome addition as well. The plot may have solid foundations but the execution is all over the place. Many individual scenes are good but the structure of the film is really clunky. Splitting up the characters for a good chunk of the running time is a mistake as it lessens the interactions that can be had and there’s a tendency to repeat things that people liked about the first one such as a prison break sequence that definitely goes on for too long. Another issue with the plot is a lack of consequences to major events or decisions made. So many things are shrugged off with no real weight being given to them. There are some emotionally resonant moments but these are relatively few and far between. In general the film feels a bit long. There are significant pacing issues throughout that the narrative struggles to recover from and the whole thing doesn’t quite feel connected in a cohesive way. Scenes seem to exist to get to the next action sequence and the plot progression often doesn’t make sense. The action sequences were visually very impressive but they were also incoherent in some places. The final confrontation is a bit of a CGI mess that seems to be throwing everything at the screen in the hope that it will all come together. Some sequences were really inventive such as an exciting starship chase and the opening which probably more qualifies as a dance routine than an action sequence. As far as I’m concerned this was a vast improvement on the first one. My problems with the first one stemmed from a personal inability to connect with the sense of humour. I didn’t have that issue this time and found the experience generally a positive one. I like that the theme of family was explored throughout in different forms and the expansion of the dynamics established in the first one. Peter Quill finding out about his father and spending time on them bonding as father and son was a nice idea that worked due to the performances of both Chris Pratt and Kurt Russell. Ego was a compelling villain which probably has a lot to do with Kurt Russell as the writing could be a bit thin. The rest of the characters don’t have as significant arcs but everyone has something to do. Rocket is entertaining enough with his small arc involving him learning to not push people away and Drax continues to remain true to himself which is always entertaining. Baby Groot is used really well in key scenes and is sure to be a fan favourite. The story itself is somewhat all over the place with poor pacing and scenes not feeling quite connected to one another in the way they move the story forward. There was a lot of visually impressive action though some of it was incoherent, particularly in the climactic sequence.